The story of Dropcam is a classic tale of Silicon Valley success. Late Friday, Google’s Nest announced that it was buying Dropcam for $555 million in cash. Dropcam is a simple internet camera that people can set up to watch their homes or places of business. Then they can pay for cloud storage for the videos if they want. The company says that 39% of its customers pay for its cloud. But Dropcam started out as a side project to help Duffy’s dad, who was trying to find out which of the neighborhood dogs was leaving droppings in his yard, according to the history posted on Dropcam’s website. Greg’s dad kept fiddling with webcams but couldn’t get them to work right and didn’t want to store the huge video files on his hard drive. Duffy and his friend Virani thought they’d stumbled on the next big idea, a home surveillance camera that turned on when it detected motion and would store the videos in the cloud. Sadly, none of the investors they talked to were interested in funding them until they talked to tech pioneer Mitch Kapor. He kicked in the seed money. 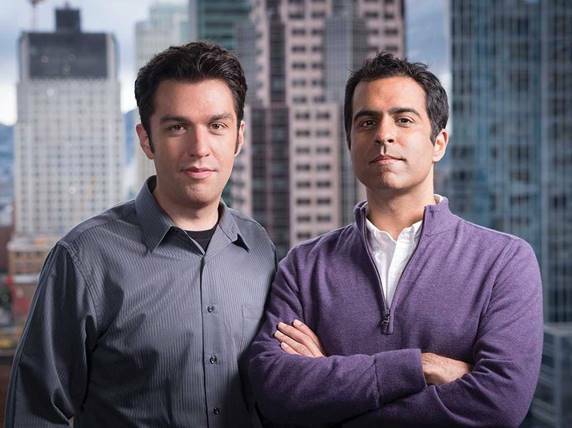 Duffy and Virani, who wrote most of the original code themselves, created the product and Dropcam launched in 2009. In the early days, Duffy and Virani packed and shipped every Dropcam sold themselves. With Kapor on board, they had far less trouble getting new rounds of investment. Eventually they raised nearly $48 million beyond the seed round, including a $30 million round about a year ago. And this week, they walked into the arms of Google Nest, and a half-a-billion-dollar exit. Dropcam has never disclosed its revenue, but as Re/Code’s Liz Gannes points out, it is regularly listed as the top-selling security camera on Amazon, and it recently started being carried in retail stores like Apple and Best Buy. It became popular as a baby monitoring cam. And yes, Duffy’s dad caught the dog and, apparently, still has the video to prove it.